Instead of incising Gerota's fascia to enter the plane between the adrenal and the upper pole of the kidney as described above, an alternative technical strategy can be employed. After port placement, the Gerota's fascia-covered kidney is retracted anteromedially, exactly as one would during a radical nephrectomy. Gerota's fascia is incised longitudinally parallel and 1 to 2 cm anterior to the psoas muscle. Renal artery pulsations are identified, and dissection is initiated immediately cephalad to it. This dissection is performed in the cephalad angle between the renal artery and the inferior vena cava on the right side and between the renal artery and the aorta on the left side. Dissection proceeds superiorly along the anterolateral aspect of the inferior vena cava or aorta. 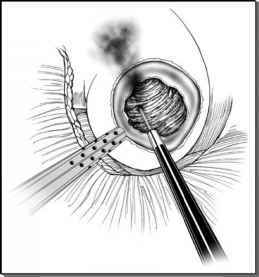 Inferior adrenal vessels originating from the renal artery and vein are clip-secured at this location. Continued cephalad dissection between the adrenal gland and the ipsilateral great vessel reveals small middle adrenal vessels, arising from the aorta and vena cava, which are secured. On the right side, the main adrenal vein, draining into the inferior vena cava, is the next structure to be dissected, clipped, and divided. On the left side, the main adrenal vein may not be identifiable at this juncture and may require circumferential mobilization of the adrenal gland before it comes into view.